Sherban (rhymes with “bourbon”) splits his time between Maryland and Maine, and has often been called the next P. G. Wodehouse, or at the very least the current Sherban Young. He is the author of numerous witty mystery novels, including two detective series: one starring Enescu Fleet, well-aged man of the world; the second featuring Warren Kingsley, bodyguard not-so extraordinaire. He is not much of a cook, but he is always happy to supervise and offer unsolicited advice to those who are. Fleeting Promise: An Enescu Fleet Mystery, Book 5, is a private investigator mystery written by Sherban Young. Hathaway and his new bride, Lesley, had barely gotten home from their honeymoon when they found themselves headed into the Maine woods to attend the grand opening of Le Vrai Cornichon, at the invitation of the host, Johnny's old school chum Ditters Dittersdorf, the pickle fancier and purveyor. His best friend and sometime sleuthing partner, Hutton, and his fiancee, Ate, have also been invited, as has the eminent and retired sleuth, Enescu Fleet, although no one is exactly sure who actually invited him. They are in distinguished company as the event is also being attended by three food celebrities, including Elsie Farmer, a woman whom Ditters had dated before meeting his wife. Ditters seems to have confided in just about everybody about that long-ago affair except for his somewhat jealous wife, Betty, and her retired sheriff father. When Elsie’s body is found in a shed, Fleet, Hathaway and Hutton have their work cut out for them, especially as the murderer seems particularly reluctant to let anyone leave the premises. This latest installment in the Enescu fleet mystery series is fast-paced and breezy. The premise is delicious as the hosts, their guests and the staff are held hostage by the combined forces of the elements and an unknown assassin. Johnny Hathaway is a marvelous and self-deprecating narrator who frequently breaks up the tension with his trademark blend of irreverence and wit. Young's plot is inspired as the embattled occupants have to work through a number of clues and puzzles, not only to find out who the murderer is, but to ensure their very survival. Fleeting Promise delivers a strong and provocative English manor-style mystery set in the depths of the Maine woods. There are plenty of red herrings, secret rooms, and pickle-themed dishes to keep any reader happily occupied. 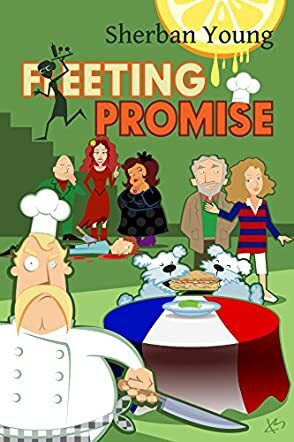 Fleeting Promise is great fun, and it's most highly recommended.